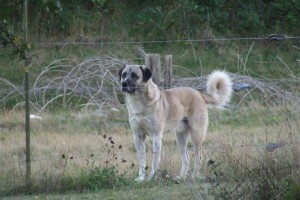 We have been raising Anatolian Shepherds for 11 years. 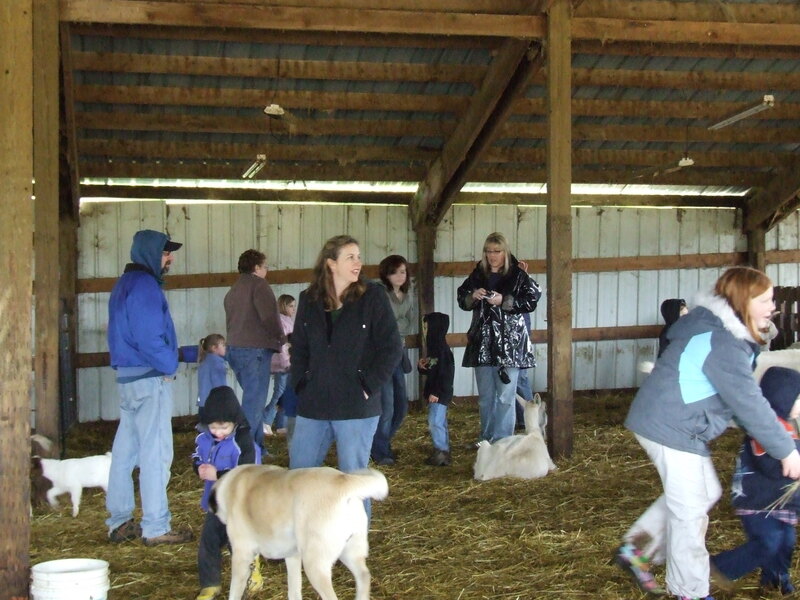 We owned a 13 acre, Grade A Goat Dairy and we usually had from 100 – 180 goats on our farm. We bought our first dog when our then 19 year old daughter did some research for us, and found this breed. We also read the information she had found and, since we had 7 stand New Zealand fencing, we knew we had secure enough boundaries for the dog. 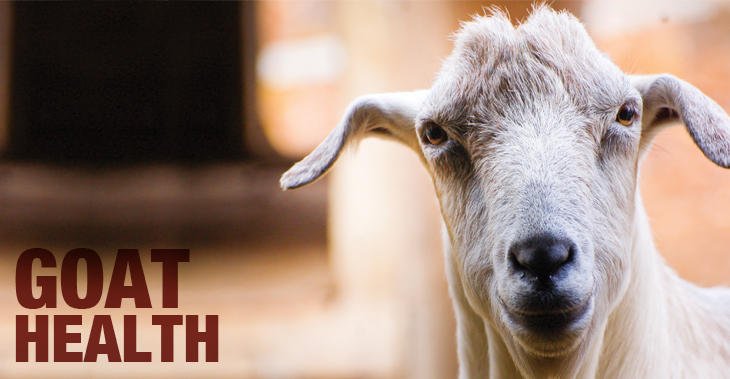 Bernie was only five months old when we drove over the Blue Mountains to get him, and he had been raised with goats. The life span is usually 13 -15 years and Bernie was a white and biscuit color. He grew to weigh about 125 pounds. We tied him up in the middle of the barn so he could meet the goats, then we would turn him loose when we were there to watch him. He was all puppy and wanted to play with the goats by chasing and chewing. We never disciplined him for either, other than saying “No” and sending him away from them. In one of the articles we read it said not to play with the working dog – you could love on him but not play. So we did just that. We did work with him on taking his food away and giving it back; this would ensure he wouldn’t bite us if we needed to take something away. We also worked with him on two commands, “Down” and “Come”. When Bernie was about 9 months old we started taking him out into the field with the goats and letting him run in the fields. Then in the evenings, we would turn him loose in the barn while we did chores – so we could watch him. When he was about 1 year old we started locking him out of the barn at night so he could patrol the fields. 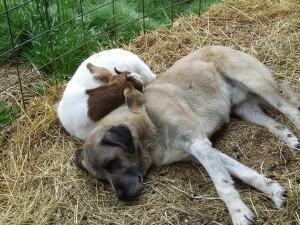 He was still not trustworthy with the goats unattended. 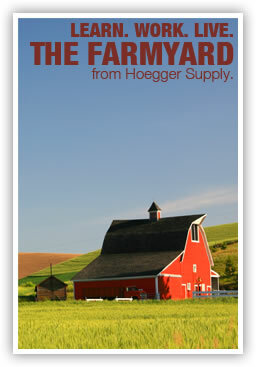 He would be chained up during the day in the middle of the barn. We did this until he was 2, and one day we turned him loose in the morning and never had to chain him up again. He would walk through the herd, be attentive to the baby goats and take wide berths around some of the older does that didn’t like him. He slept on the big tires in our pasture, keeping watch. 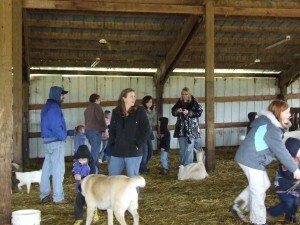 During his whole life we had lots of people over taking tours of our farm. He never growled at them and was very loving to all that wanted to pet him. I remember one tour that had a one year old; they put the baby down to pet the goats and Bernie walked between the goats and the baby. He didn’t want the goats to get too close to the baby. Another time one of the baby goats was sleeping cuddled up next to him and we have also seen him sleep next to a doe that wasn’t feeling so well. Some people say you have to watch these dogs for aggressive personalities, but this has not been true with any of our dogs. We would tell people they couldn’t bring any dogs to our farm, because we didn’t want our dogs to be friends with other dogs – so they would do their job. One story about our female is that we soon discovered she was a runner, just meaning if there was a way to get out, she would. Catching her was always very hard. She wanted to stay loose and would play ‘catch me’ for hours. When we would catch her we would chain her up and then tell her bad dog. She would stay chained up for about four or five days, and would then be turned loose with the other dogs in the field. While on the chain she was a drama queen… so sad, and wanted to get loved on and petted. The son of Bernie and Cloe that we kept is a real gem. He can get out and he comes to you. He loves people and we have not had any problems with him. He is now three years old and is a great guardian. 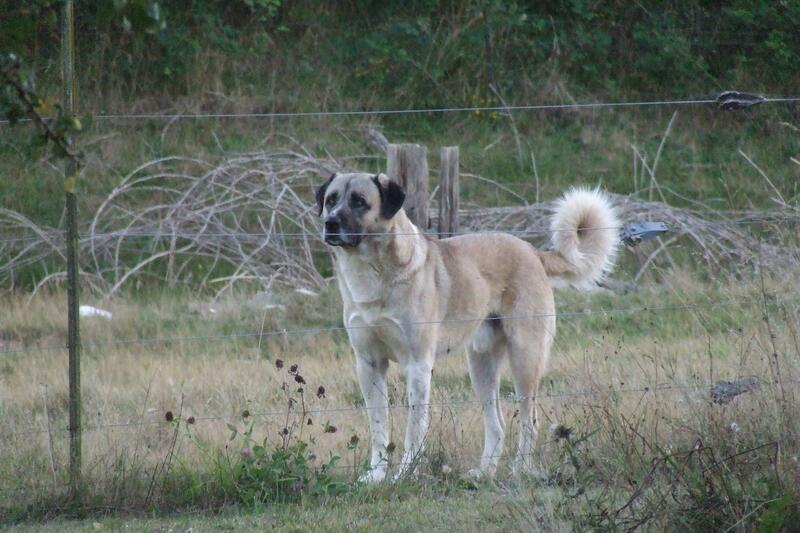 We have really enjoyed our Anatolian Shepherds and would highly recommend them for guardians.